Note: In honor of International Talk Like a Pirate Day, I have republished this post. As I write this post, some scientists are searching for ways to prevent male baldness through genetic manipulation. Others are conducting similar research to cure cancer. Is hair really as significant a part of our identity as we are sold to believe? 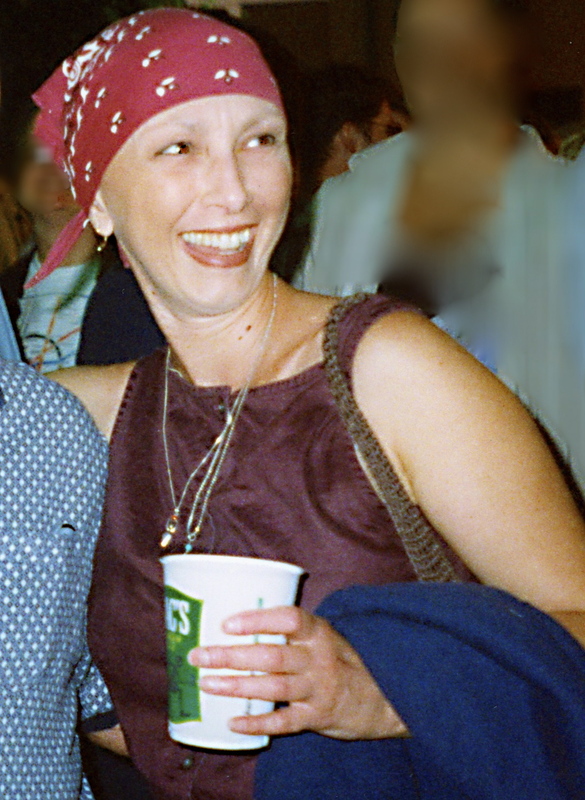 My hair began falling out the 14th day after the first chemotherapy infusion. In preparation, I bought a wig, styled and colored the same as my real hair. Like a feral animal, it perched on its stand, awaiting an opportunity. When I saw the first ungodly huge handful of fallen hair I was too stunned to cry. Instead, I mumbled, “F***,” repeatedly, like a demented chicken. It didn’t fall out all at once. Each morning for a week, I’d step out of the shower holding gobs of hair in my hands to prevent clogging the drain. After blow-drying what was left on my head, I’d take a pair of manicure scissors, like a naughty three-year-old, and try to even it out and disguise the bald patches. When I no longer could, a coworker’s husband shaved my head while she collected the locks, tying them into small bundles with blue satin ribbons. After a time, I stopped wearing the wig. I preferred to cover my baldness with a red bandana, pirate style. There was no place to run. He belonged to a club, of sorts, of people in Portland who dress like pirates and act out sword fights. I puzzled over what he wanted until he reached into his blouse and pulled up a goddess pendant dangling from a leather thong around his neck. He brought the goddess to his lips, kissed it, and then pointed to the carved turquoise goddess I had worn on a silver chain since my diagnosis. Doffing his hat, he bowed before swaggering back into the crowd. He had approached because of the necklace, not the bandana. He hadn’t noticed that I was bald — or had he? Did I just have an encounter with an eccentric or a very kind man dressed as a pirate offering encouragement? He left me smiling. There is more to each of us than what we look like. This post was originally published by TheONC. This entry was posted in Nursing Lifestyles, Oncology Nursing, Posts About Art & Nursing, Surviving Cancer and tagged Ahoy, alopecia, bandanas, Hungary, International Talk Like a Pirate Day, Johnny Depp, nurse blogs, oncology nurse blogs, pirate style, pirates, Portland's Pioneer Square, side effects of chemotherapy, surviving cancer, The Goddess, TheONC by jparadisirn. Bookmark the permalink.